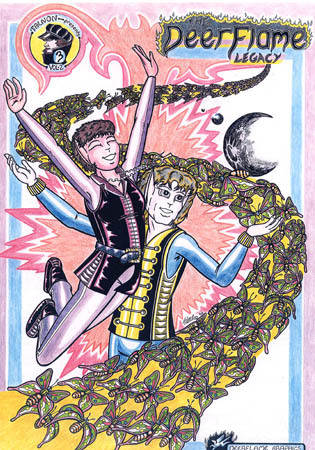 Although Tale-Trader:The Legend Of Twarin was my first official publication way back in 1994, it was not the first story I ever wrote, or indeed started. The creatures and world featured in it are, however, true to the world I had established many, many years before, before I even discovered the existence of comics other than the Disney or Disney-like humorous cute animal tales. I could say it all began the moment I was born, and in a way, for some of us, that is probably the case. But I'll scoot ahead a couple of years to my adventurous primary school days, when nothing seemed impossible and nowhere was out of bounds. For me, the time I spent out of class was by far more rewarding than those long, stretched out hours spent learning the same useless facts without reason. To me primary school could quite easily be condensed into just a couple of years without the excessive 'padding' like that commonly found in dull movies. But I guess it did give my mind time to wander and invent worlds I'd rather be in and people I'd rather know. And so I remember those years to be full of make-believe adventure where I could be anyone and do anything. No stereotypes applied, and nothing was out of the question. I drew and drew and wrote story after story, but unfortunately in my school days there was no real outlet for such a passion, nor was the development of the imagination considered as important as the learning of facts and events in human history. I guess I could never really understand then why my world's history was always to take a back seat to a human history that has never really been totally accurate, and written only in the male perspective. So I just wrote my own books for myself. One such set I remember having written were styled after the 'Mr Men' books. Theses were really popular at the time, though I must say there were never enough of the female version. But I liked their simplicity and invented my own little creatures. I produced quite a number of these and was somewhat proud of them. I told my class of my book-making skills but no one believed me. So to prove them wrong I decided to take my creations to school with me. It was a windy, rainy day and by the time I got to school and opened my bag, I could not find my little books anywhere. Everyone, including the teacher, said I was lying about them -- how could anyone make books without years and years of training and lots of money? I was sure I had packed them -- where could they have gone? So I wandered home that day, with my head tilted, deep in thought, and as I neared the house, I saw in the gutter along the street, all my books slowly being washed away, the coloured texta pictures blending into an unrecognisable sea of mixed colour. They must have somehow fallen out of my bag and blown onto the road. I was devastated and decided never again to make any more books. The years went on and still strange creatures filled my head. I could no longer stop the urge to draw them and so I gave in. But it was different now -- I was in high school and for some reason it was now OK to have an imagination! So I drew and drew and made books non-stop. Some were about the adventures of my people, others were about nature and all the animals and plants I loved. But unfortunately, other people also liked my books, and many were stolen or never returned after being borrowed. Even in those young years I had experienced the 'promises' of professional publication, only to have my hopes dashed. So again, I decided it wasn't worth the heartache, and I abandoned my book-making passion. In a way this was probably a good thing, for I was now deep in study with the new experience of exams. I really did need to focus all my energies on the academic side of life, for it was something I was quite good at when I put my mind to it. This was also the time I discovered ElfQuest. Comics never really held my interest before, since the ones I had seen on the news-stands were full of violence and ridiculously sexist, stereotypical humans. They were designed as a quick entertainment fix for young boys who didn't care for books that required thought or a second reading. I was lucky to have grown up in an era of imaginative and inspirational television and movies. Programs like Dr Who, Star Trek, Lost In Space, Time Tunnel, Battlestar Galactica, Blake's Seven, V, Tripods, The Tomorrow People, Land Of The Lost, and Land Of The Giants (to name but a few) were not only highly imaginative and entertaining, but they were also extremely inspirational. They made you want to write and create, they made you want to explore your own imagination and dreams. And they had a 'purpose'. Things were not done without reason, and actions had consequences. People now cringe at the though of 'moral' tales but that is exactly how we live and learn. I love animations such as Kimba and Astro Boy -- fun to watch, but also morally strong. Fables and fairy-tales are an important part of our culture, and it is the moralistic tales that have been remembered and treasured throughout history the most. But even then, I still had no thought of translating my world into a comic book... until I saw the movie The NeverEnding Story. To this day I cannot think of a more imaginative and beautifully filmed story. It made me want to tell my tales in the same fluid, unbroken style, as if it were a living, breathing entity. Simple prose just couldn't reach this level of intricacy that I demanded. And then I remembered ElfQuest -- a book that was just as alive as a movie. This is when I realised I had no option but to collect all my creatures and stories into this unique form of storytelling. And so I did just that. After my very last exam in high school, when everyone was celebrating their new 'freedom' (as most people went on to work instead of going to University), I snuggled up on my bed and started to write... and write... and write. I did not stop until the next morning, falling asleep with hundreds of pages of stories and sketches scattered around me. It was all there. Stories from the middle, stories from the end and beginning. The next task was to sort out all these stories, written in no particular order and find out how they're all connected. No simple task I can assure you! And it did take a very long time -- I was well into university when I finished weaving the first tapestry of The DeerFlame Legacy. However, it was still not yet in comic book form, except for 15 experimental pages (done long before I even embarked on illustrating it) that now grace the 4th issue of the 1st giant book. When I began writing it in summary form, I believed it would be no larger than 500 pages -- but now of course, after hitting the 500 page mark, I realise I have a very long way to go to even begin that original first story! But before I had even started putting pen to comic book paper, the graphic novel Tale-Trader called me to its creation. Of course there's a whole other story to that one, and it wasn't until Tale-Trader was complete that I could actually start on The DeerFlame Legacy. Work, fencing, more study and other commitments aside, The DeerFlame Legacy, in 1995, was going full speed. I was putting out a 30+ page b&w comic every 3 months. I was probably the most regular publisher of any Australian independent comic. After the 3rd issue it became less of a chore physically and mentally, and I was able to pick up speed. I was used to drawing my people and they were very adamant about just how the action was to take place. They became more and more a part of me, and it was nearly impossible to be away from them for long. The amount of stories seemed to expand dramatically, as did the number of characters who demanded to be seen. It was not uncommon for hundreds of uniquely individual 'extras' to grace a page, no matter how much I tried to convince them otherwise! By this time, with many issues under my belt, I decided to take my work to an audience I thought would benefit from its 'uniqueness' -- high school children. Through a lot of hard work I had arranged to distribute bi-monthly books to many schools around Australia. I even had a friend willing to help with this monumental task. But alas, as all was nearing administrative completion, the distributor pulled out, citing that the already-established school magazine market would no longer use his services if he took on my books... and of course, they were his main money earners. And so, having survived other devastating blows, I conceded that it was not to be... for now anyway. Luckily, I had not yet financially committed to that project, which would have probably seen the end of my ability to continue creating The DeerFlame Legacy. But it did take its toll. So I continued on, knowing that someday my work would get to the right audience. Even with more broken promises of publication overseas, I drew and drew, gaining comfort in the support of those who enjoy my books. In particular, the confidence in my work from a man whom I have long admired inspired me to keep going. Sir Norman Wisdom -- legendary entertainer, movie star, humanitarian. He enjoyed my work enough to want to write the forward to the first giant book. I can't tell you what that meant to me, and always will mean. If someone like that can see something special in my books, then there is hope! And so I'm still drawing to this day, putting out a book whenever I can, no matter what adversity or hardship comes my way. After all, they won't let me stop until all 6 giant stories are complete... and even then, who knows...!